Because some of the comments I hear coming from these people would be hilarious if they didn’t actually believe them. Hell, sometimes I even feel sorry for them. For instance their hero is President Reagan, someone they call a “true conservative.” Except, they can’t tell you exactly how he was a conservative. He quadrupled our national debt, something Republicans don’t deny. Yet they still consider him the epitome of “Republican conservatism.” Then again, both George H. Bush and George W. Bush grew our national debt, so if Reagan is the example of “Republican conservatism,” they followed that example perfectly. Most sane people know that being “fiscally conservative” doesn’t mean running up giant deficits, so calling Reagan a “conservative legend” doesn’t make any sense. April 14, 2013- Bob Perry, a wealthy homebuilder and philanthropist who was among the nation's largest political givers, has died at his home in Nassau Bay, near Houston. He was 80. His death was confirmed by lobbyist and former state Rep. Neal T. "Buddy" Jones, a family friend and business associate, who said in a statement, "Bob Perry passed away peacefully in his sleep last night. The family asks for privacy right now as they grieve their loss. They look forward to talking with their friends in the coming days." Jones added a personal note: "Bob Perry was a friend to many, many people all over the United States, and he was a true patriot. He will be sorely missed. Those of us who knew him were blessed by his friendship." Anthony Holm, a spokesman, also confirmed Perry's death: "Mr. Perry, one of the finest human beings I've ever met, passed away peacefully in his sleep last night." April 10, 2013- GOP strategist Karl Rove ventured into hostile territory on Tuesday night, delivering a speech repeatedly interrupted by boisterous protesters at the University of Massachusetts at Amherst. March 17, 2013- GOP uberconsultant Karl Rove lashed out at former Alaska Gov. Sarah Palin (R) on Sunday, mocking her decision to leave office early. Rove's criticism was a response to comments Palin made at the Conservative Political Action Conference in which she suggested the poor performance of Rove-backed candidates in the 2012 elections indicates that Rove should get out of the political consulting business. "If these experts who keep losing elections and keep getting rehired and getting millions — if they feel that strong about who gets to run in this party, then they should buck-up or stay in the truck," Palin told CPAC Saturday, referring to Rove. "Buck up or run. The Architect can head on back to the great Lone Star State and put their name on some ballot –- though for their sakes, I hope they give themselves a discount on their consulting services." March 16, 2013- As we mark the tenth anniversary of the U.S. decision to invade Iraq, surely it makes sense to acknowledge the consequences of our conduct, and just this week scholars at Brown University released new estimates of the war's cost in treasure and blood: $6 trillion and at least 190,000 lives lost. The magnitude of these costs makes it particularly important to understand why the nation opted for war, and to consider, in particular, former White House Senior Adviser Karl Rove's contribution to the decision, a contribution that never has attracted much attention. February 28, 2013- GOP strategist Karl Rove continued to defend his new elections project this week, explaining that the controversial plan to thwart Republican candidates who might be too extreme to win general elections was a response to intense donor pressure. Speaking to the National Center for Policy Analysis, Rove said he'd decided to launch the Conservative Victory Project, an offshoot of his American Crossroads super PAC, after being confronted by disgruntled contributors unsatisfied with the group's awful record in the 2012 elections. The former House speaker, who benefited as a 2012 Republican presidential candidate from the super PAC Winning Our Future, lashed out against Karl Rove, the former Bush political guru and founder of several Republican super PACs, on Wednesday for his effort to bounce GOP primary candidates who might fare poorly in a general election. No one person is smart enough nor do they have the moral right to buy nominations across the country. February 19, 2013- A tea party group portrayed leading Republican strategist Karl Rove as a Nazi in an email it sent Tuesday — and later had to apologize for it, blaming a contractor. 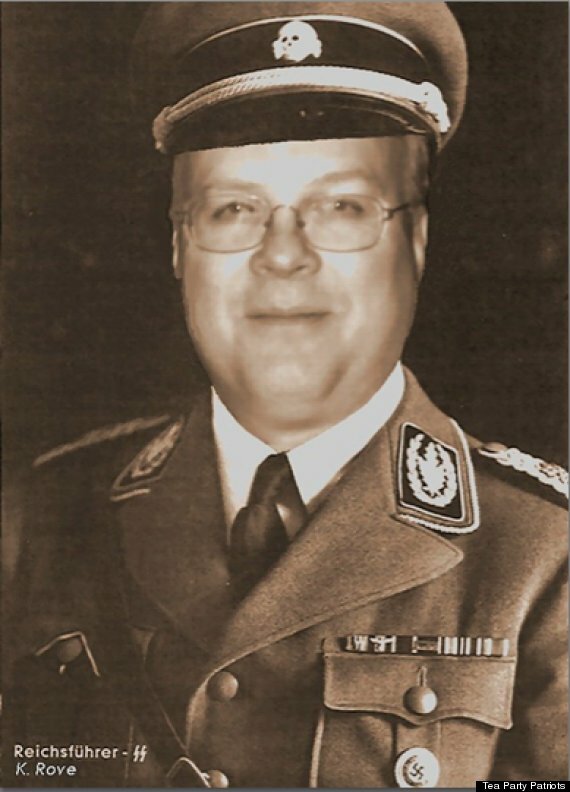 The Tea Party Patriots, a well-established group within the right-wing movement, sent out the message featuring a Photoshopped image of Karl Rove in a Nazi uniform, Politico reported. The email's subject read: "Wipe the Smirk Off Karl Rove’s Face." The email was sent under the name of Tea Party Patriots co-founder and national coordinator Jenny Beth Martin in a fundraising solicitation. But Jameson Cunningham, a spokesperson for the group, said it was an unfortunate accident. February 18, 2013- Nate Silver, the oft-attacked numbers guru that accurately predicted both the 2008 and 2012 presidential elections with eerie accuracy, has some bad news for Karl Rove. I really hope Rove completely ignores him. February 15, 2013- DES MOINES, Iowa — Turmoil deepened among leading Republicans over efforts to ward off controversial candidates in the next election, as Iowa Republican Gov. Terry Branstad blasted a new candidate-steering plan by Karl Rove and warned him to stay out of state and congressional races. "I basically told Karl Rove that what he was doing is counter-productive and he needs to stay out of it," said Branstad, recounting a phone call to Rove, the leader of the new Conservative Victory Project. In the aftermath of last fall's disappointing election outcome for the GOP, party leaders have been focusing on fielding more candidates with broad appeal – and fewer unpredictable ones – but have split bitterly over how to do it, worsening party tensions.